What is Magical About August 13, 2008? Let’s see now, by the numbers what is magically powerful about August 13, 2008 ~ it’s Wednesday the 13th, not Friday the 13th, which may be a very magical day for some, especially if your story is halloween spooky with lots of naughty tricks or treats. August is an 8 month in numerology, meaning all things material, money and what looks good, or appearance makes the woman or man. Think Paris Hilton, although, I’d rather not think about her. Or, for a more elegant sophisticated example, think of the month of August as Audrey Hepburn, as she appeared in Breakfast at Tiffany’s, the film which hallmarked the chic glamour stylings of New York City in 1961. The day, the 13th, is a 4 (1+3) which denotes stability, the four corners or what you build a future on, whether an event or a decision. And 2008 is a 1 year (2+8=10=1) ~ it’s all about ‘numero uno’ and the competition to be the best. Thus, ‘we are number one’ or ‘we want to be number one’ are the attitudes of this year. August 13, 2008, what does it all add up to in the science and art of numerology? This would be called a 4 day (8+4+1 = 13 = 4). While 4 is a great number in it’s own right, it is so NOT my best number according to my own personal numbers (birthdate and name). However, the vibration of FOUR is powerfully magical in the realm of the practical, or for bringing forth and creating a stable future by acting on good solid decisions. So okay, I’ll happily take what I can get in this case. Very happily! I’ll take and go with the vibration of FOUR and hopefully the universe will POUR out its goodies and blessings. Yet, what is really and truly magical about the day for me? Ta-da! 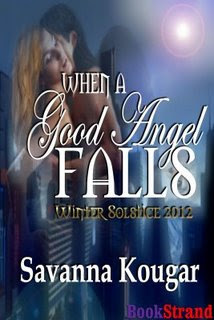 This is my release day for When A Good Angel Falls with BookStrand. On several levels this story is truly a labor of love for me, not only as a unique May-December romance ~ Volcano’s seduction of his fallen earth angel *insert my sigh here* ~ but also, I explore another passion of mine, the paranormal and mystical adventure of life. Or? By the numbers: December, the 12th month ~ the date of the Winter Solstice, the 21st ~ and the year, 2012. First, what’s most obvious is 12, then 21, another 12 ~ or, in numerology it all breaks down to the number, 3 (1+2=3), which is known as the number of communication. So, we have a focusing of all power toward communication, every level and method of communication, from international news to a one-on-one dialogue, from the most spiritual to the most personal. Imagine * if you will * a wand belonging to a powerful sorceress. She is concentrating and summoning all the forces of nature, all power of the supernatural to her wand. Thus, to perform a magical spell, and bring forth change or a new beginning. So it will be and shall be on the Winter Solstice of 2012 ~ this day is, essentially, a numerology wand, or the sorceress gathering all the vibrations together for one intense focus on communication, all levels and every dimension of communication. Okay, for the rest of this short story. The year, 2012, adds up to the number 5, in numerology (2+0+1+2=5). Now we have the 12th month, a 3 ~ the 21st day, a 3 ~ and the year, a 5. Again in numerology this adds up to 11 (3+3+5=11). At 11:11 pm on December 21, a Friday, the Winter Solstice of 2012 will occur. And Earth will be directly lined up with the galactic center of the Milky Way. This has not happened for 26,000 years. Significant to humanity? Or a significant communication to humanity from the cosmos? You be the judge. Or, take a super-speed ride with Sedona and Volcano on their Winter Solstice 2012 adventure, and then be the judge. Very interesting you have put alot of work into your view . I have the same conclusion that there will be an earth change on 2012 but my views differ on how it may come about . Good info on your part ! .